Let our team do the hard work of searching the UK property market to find great property opportunities, while you sit back and enjoy the benefits. Returns... High rental yields averaging 8%+. Growth... Key Cities & Towns in areas selected for growth across England and Wales. Condition... New Build Developments or Newly Refurbished Housing Stock. All ready to let condition. Prices... Get started for as little as £40k or invest in £1mil+ portfolios. Exclusive... Including off-market opportunities that aren't available anywhere else. Save you time... We search the UK property market weekly and hand pick the best property deals we can find to bring to you. But which is your preferred investment strategy? A professional buy-to-let is a buy-to-let property investment, that is suitable to rent based on it's location, price range, condition and size for professional tenants; these can be individuals, couples or families. Professional tenants are tenants that have a job and an income to cover their rent. Great locations across England and Wales, including major cities and towns. Purchase price from as little as £40,000. Average purchase is between £100,000 and £180,000. 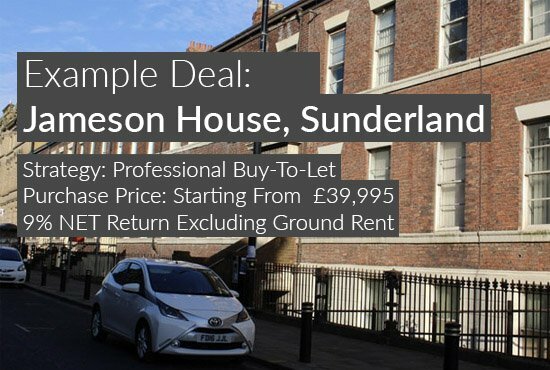 Top condition properties, ready-to-let and often already tenanted. Many are new builds or recent refurbishments. Finance your purchase with cash or mortgage finance. It's your choice. 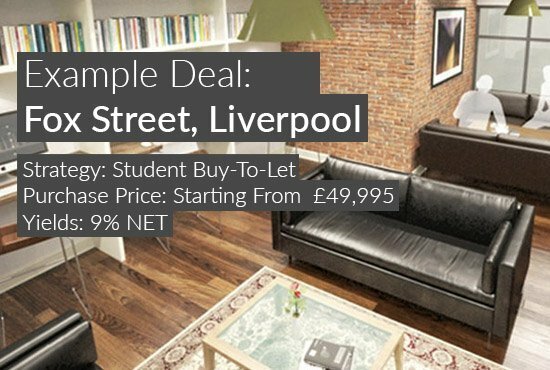 Student buy-to-lets are very similar to traditional rental properties but designed to appeal to the student market. Often they feature more communal spaces and are designed to promote co-living. And, of course, location to Universities and Colleges is of paramount importance. Locations in major cities such as Manchester, Liverpool, Nottingham and others. Close to university campuses, key university buildings and social hubs. Purchase price starting from as little as £40,000. Average cost is £60,000+. Rental yields starting from 7% net with many achieving circa 9% net. Financing is straightforward as buy-to-let mortgages can be used. But, a cash purchase may be required for lower value properties as there are more limited lending options for lower priced investment property. A rental property or buy-to-let becomes a corporate buy-to-let when it is rented to a company rather than an individual. So, instead of renting it out to an individual for the medium to long term (6+ months), a property investor will rent it to a company or organisation for the short term (anything from a few days to a few months). This rental model can attract much better rental values due to the nature of the letting. Locations mainly in city centres or business hubs such as Manchester, Birmingham, London, Luton and many more. Purchase prices starting from £150,000. Rental yields start from circa 10% net returns. In a great condition and ready-to-let. These properties are all either recently refurbished or new builds. Finance for these real estate investments typically involves a cash purchase although corporate financing options are available, it is more limiting raising finance for this rental model. I have worked with Rob for over 3 years now and I can't recommend him highly enough. His approach to property investments far surpasses other companies out there. I look forward in working with him again on other projects. Rob has in-depth knowledge on the property market and has helped me acquiring my first buy-to-let investment property which currently yields a very good return. Looking forward to acquiring my second property in the near future and the assistance from Rob. A professional and excellent service that is highly recommended. Rob worked together with me continuously for about 8 months to get me a fantastic very high rental yield HMO and provided me with the best team I would have asked for. Rob, I couldn't have done better. Very helpful support, highly qualified team, which makes the process of choosing and buying the property much easier. Looking forward for the cooperation in the future. 1/ How Do You Find So Many Opportunities? To find the best selection of properties on the market we have partnered with a number of external agencies. 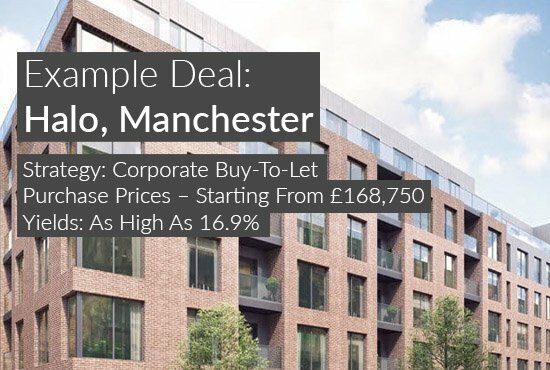 If we were to source these properties entirely on our own, we would be limited to working with only a handful of properties at a time, meaning that we would be unable to provide the range of property deals and opportunities that we strive to deliver. We have searched far-and-wide for the best developers, agencies and platforms to partner with and have chosen to work with some fantastic, reputable companies, who are well-and-truly at the top of their game. 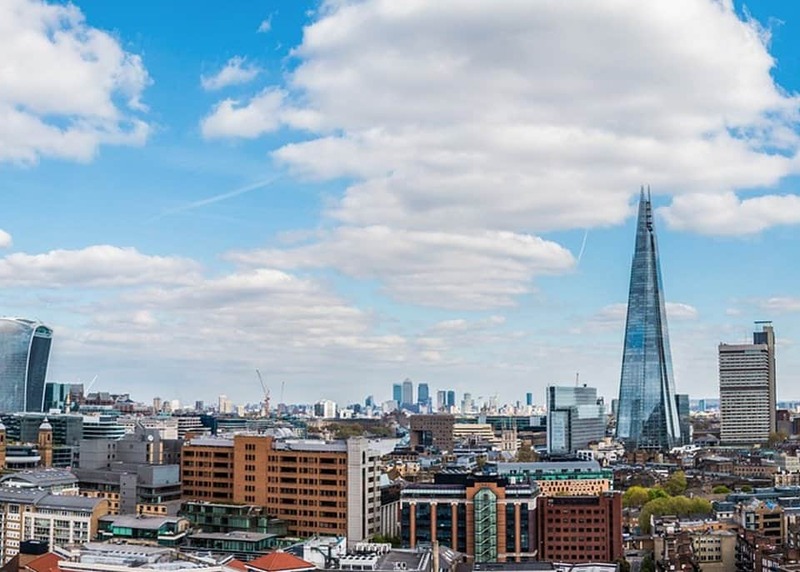 These partnerships mean that we are now able to give our Property Club members access to much larger, expertly-curated lists of the best property opportunities in the UK. And from the wide range of opportunities that we offer, you can build on your portfolio and expand your property business, quickly. So, whether you are interested in buy-to-let, student buy-to-let, serviced accommodation or off-plan developments, why not join our Property Club today by filling the form in, above? 2/ Can I View The Properties? If you want to do a viewing it won't be a problem with the majority of properties that we promote. You will, however, need to organise your access with the company that is managing the sale. Please note that when it comes to new-build developments, viewings may not be possible until close to the development completion date. This is due to health and safety regulations regarding building sites. Site location access, however, may still be possible and can often be arranged with the company you are buying from. 3/ Are There Any Sourcing Fees? Unlike most sourcing companies we don't charge any fees and it is completely free to join our Property Insider's Club. Once you are a member we will introduce you to the agencies and developers that have best property opportunities available to suit your circumstances. On joining, you will then recieve information about what is available and be given the opportunity to proceed, directly with the developer or agent, if you spot a deal that is right for you. 4/ If Joining the Property Club is Free, How do You Make Money? Our mission is to continually search the UK property market and partner with the best agencies and developers to offer the widest possible range of premium property opportunities to our members. We do not charge our members for this service, nor do we charge a sourcing fee. Sometimes, we will be paid by the third party who is managing the sale in exchange for introducing one of our members to them. If you choose to purchase a property through one of our partners, the price you pay will always be better or the same as you would pay if you had found this company, independently of Property Investments UK. When we are deciding on a company to partner with we look at their experience in the market, the selection and range of opportunities that they promote and at their proven reputation. We base our decisions on tangible principles that we believe will help our members and not on any commissions that these third parties may be offering. Property Investments UK is committed to bringing you the best opportunities that we can and the trust of our members is, and has always been, our primary focus. On becoming a member of our Property Club there is no requirement to proceed with any deals that you don’t feel comfortable with and you are in complete control over who will able to contact you. Property Investments UK will never share any of your personal data without your express, prior consent. 5/ If The Property Deals Are So Good Why Don’t You Buy Them All? Property Investments UK does not have the funds available to buy every deal we come across. Our property portfolio is growing year-on-year but our research brings us into contact with hundreds of opportunities, more than we could ever make use of. On top of this, our networking activities mean that we are always meeting new developers, agencies and investors. And with so many fantastic properties within reach, we decided to create a club where we could offer them to our members. Our philosophy at Property Investments UK, is that true success will always come from helping others to become successful. To see the range of property investment opportunities available from our partner developers, agencies and platforms is very simple. Fill in the form at the top of this page. When you are registered, we will email you details of the agencies we have taken the time to hand-pick, along with the opportunities they have available. You choose the companies you would like to connect with and then proceed with them from there. Your capital is at risk. The value of your investment can go down as well as up. Historic performance and forecasts are not a reliable indicator of future performance. We don't provide tax, financial or investment advice and any general information is provided to help you make your own informed decisions. Customers are advised to obtain their own independant appropriate tax, financial or investment advice where necessary. Access our full disclaimer policies here.